June ... what a glorious month it's been! I've had another wonderful month visiting new gardens; I spent two days seeing glorious properties with Rachel of Wisteria and Cow Parsley; and now I'm busy sorting out what we need for Rajasthan. It's monsoon time, so it's going to be wellies and wet-weather gear - quite a change from the raging heat we've had in England recently - but a welcome change from the searing temperatures I experienced in April. I might even see some gardens when I'm not in the villages (see photo left) and, if I do, I'll be sharing them with you! One of my favourites - Sahelion-ki-Bari - is at the top. This month took me to two new manor houses with gardens - Hidcote and Mottistone for the first time; two notable gardens where women have called the shots - Kiftsgate Court and Barnsley House; two stunning landscapes - Colesbourne Park and Buscot; and two very different castle gardens - Arundel and Sudeley. I've smelled a lot of wonderful roses, seen borders bursting with colour and wandered round a couple of water gardens - Longstock Park and Little Wantley; and many other other properties I'd never seen before. 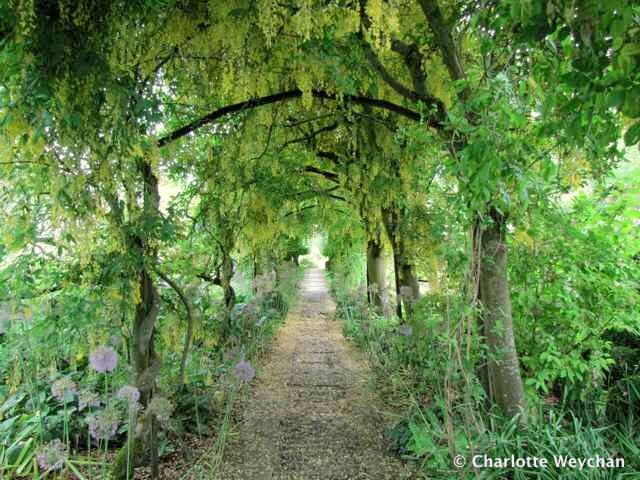 The labernum walk, Barnsley House - but past its prime when I visited! I'll be writing about them in the next few weeks and you can check my UK Directory if you're planning garden visits in the UK. 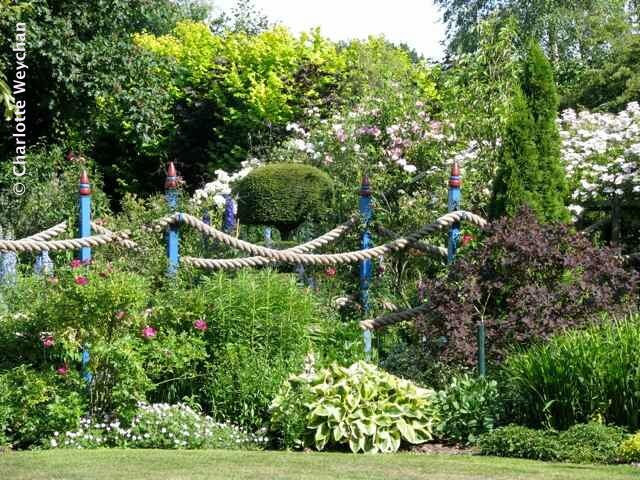 Right now it concentrates on the Southern half of England because that's where I've visited most gardens, but as I travel further afield, there'll be more and more properties heading north, so it's a growing list. There are many new bloggers on the block this month too, and I'm sure you'll want to check out their plots - John Grimshaw writing about what's going on in the lovely garden he tends (and many other interesting posts); Judyth at The Time Travelling Garden - a really wonderful read; Patio Patch, based in London's Bloomsbury; Dozen Oaks, with glorious bee pictures; and Garden 337, with wonderful pictures and words about a garden in Grand Rapids, Michigan. They're all new at Blotanical, so do give them a warm welcome! Charlotte, You're a whirlwind and a wonder. And also incredibly generous to other bloggers. Godspeed with your new trip to India. okay, call me wackie, but i just had to google hosepipe! i really enjoy your travels...keep up the good work! You've had a busy month Charlotte, and I have enjoyed visiting the various gardens with you. Have a safe trip to India. Charlotte, I clicked on the Raven link and read the post. It sounds like you are doing work that is needed and a blessing to the people there. 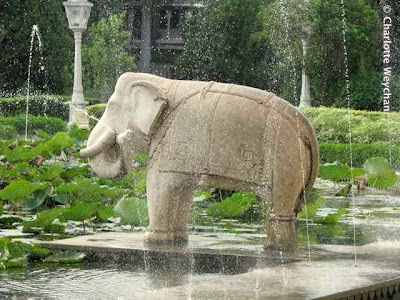 Oh, the elephant sculpture is handsome.